The color green is a balancer of the heart and the emotions helping to create equilibrium between the head and the heart. Green is associated with balance and harmony giving off this positive emotion. Green is also associated with growth, renewal, or rebirth. Its a color destination of stress relief and a sanctuary away from modern living, restoring our core back into balance and one with the earth. The color green can also promote love of nature, family, friends, etc. Its this calm and generous color that helps to produce a helpful hand of love sharing to those around us. The serentiy and peace becomes traits of others as we pass our positive emotions to others. To be one with the earth we must rid ourselves of materialistic possessions and revitalize ourselves with green nature. From both a mental and physicality standpoint, we invite nature, (green) into our bodies cleansing ourselves of the negative societal emotions. There are various types of greens. To name a few, Pale Green, Emerald Green, Jade Green, Lime Green, Dark Green, Aqua, Olive Green, Yellow Green, Grass Green. You must remember that we have a large assortment of tire cover logos so you might have a difficult time choosing between them all. We care about our customers and our main purpose is to satisfy their demands. Please be aware that your order will have track numbers available in 7-10 days from the date your order is placed. This means you will receive tracking information this necessarily mean that it will be deliver in 7-10 days. Please note this difference. We make each and every order on demand. Your order goes through several stages before it can be shipped out. Please be patient as we are working on your order. 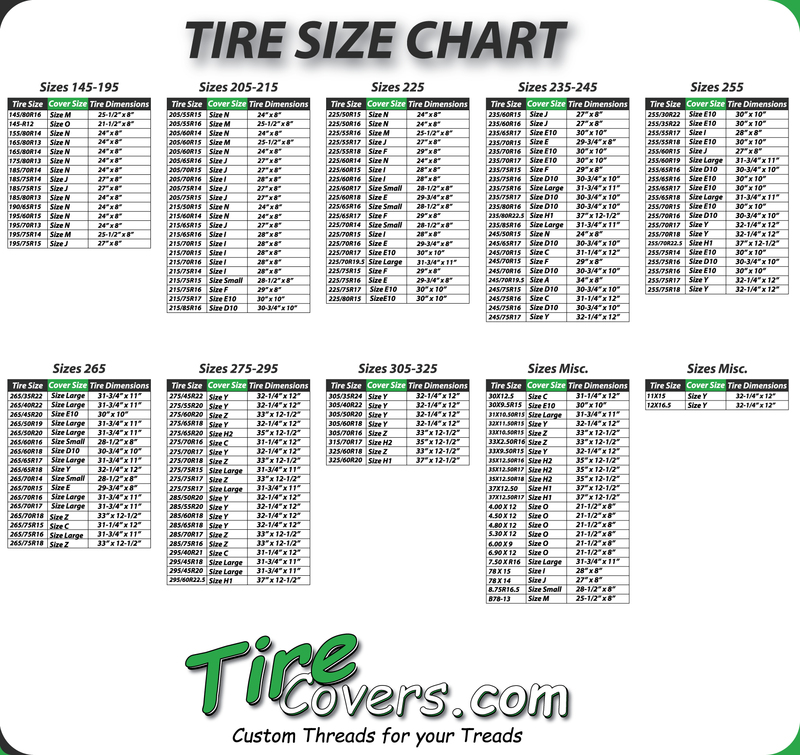 To learn more about the processes that go into you product visit our About Tire Covers page.